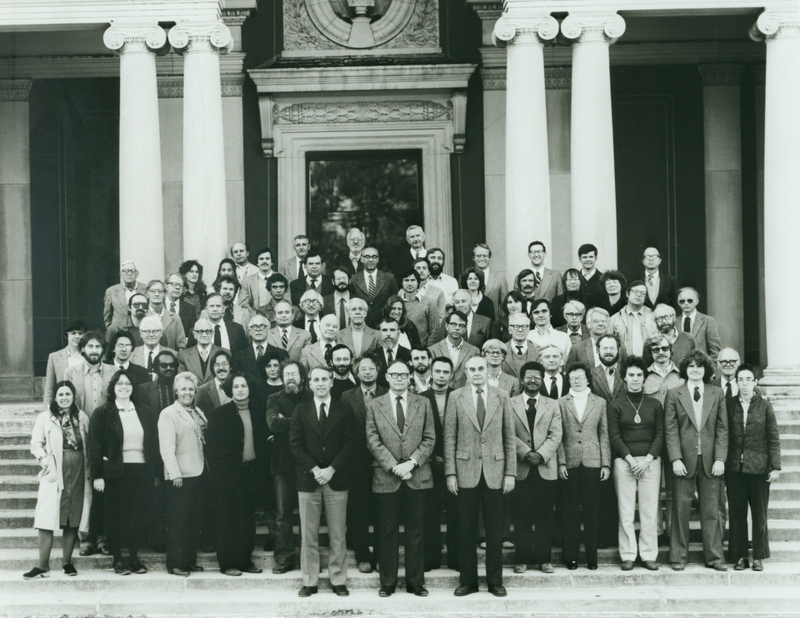 Group portrait of the faculty of the 1981-82 school year. Left to right, front row: Dean Wilhelm, President Greason, Dean Fuchs. 2nd row: Knox, Boyd, Kaster, Rand, Rose, Cerf, Hodge, Stakeman, Clark, Floge, Corson, Greenspan. 3rd row: Roth, Lutchmansingh, Hartley, Tronto, Schaffner, Dye, Watterson, Pols, Sherer, Holt, Huntington. 4th row: Kennedy, Morrell, Koelln, Holmes, Chittim, Donovan, Grobe, Burroughs, Coxe, Nagle, Curtis, Corish. 5th row: Schwartz, Karl, Nyhus, Rubin, Beckwith, Jackson, Beam, Wegner, Mitchell, Page, Nunn. 6th row: Rensenbrink, Monke, Haggerty, Ostor, Vail, Kidder-Smith, McEwen, Harrington, Dane, Cafferty, Watson. 7th row: Stanwood, Folbre, Held, Springer, Howell, Johnson, Turner, Ward, Cahn, Christensen, Butcher. Back row: Levine, W. Moulton, Whiteside, Mayo.